About the 1930’s decade. What things happened in this era? What defined this era? About the Photographer I have chosen to research which is Henri Cartier-Bresson. The background of his life. What inspired him? About the Artist I have chosen to research who is Salvador Dali. The background of his life. Who and what inspired him? What links him to the 1930’s and to Henri Cartier-Bresson. I will find most of my information from the internet to begin with as I believe it is the quickest and easiest way to get results and find out information. I need to first search about the 1930s, find out the background of that decade and important things that happened.I will then need to find a photographer within that era. I will need to find out about their lives, what and who inspired them? Look at their images to see whether I like them or not and how they do or don’t fit into the 1930’s era. I will then have to do a similar thing but with an artist. However I will need to find an artist that I can link to the photographer that I choose to make it easier to compare or differentiate their work. Once I have found my chosen artist and photographer I can then research more about them, find their artwork, quotes and references. I can also use my library to find more in depth,accurate and more reliable information from this era and about the artists. The amount of research I need to do is endless, the more I know about the era I have chosen, the artist and photographer I have chosen the better. The more research I have the more chance there is that I will discover more about the era and the people I am looking at. By doing this I will give a better presentation because my work will become more accurate and also more of my own thoughts because I will know enough about the era to make valid points as to why artists chose to do or not do what they did. I will collect Information by using internet, I will reference quotes and save the websites that I see important to my presentation and things that I would like to look back on and use in my presentation. I will write out quotes from books and reference them onto my blog also so that I can remember and re use them. I will arrange my research in the order that I did it in. I originally looked at Photojournalism to see where it would take me and told me about the “father of photojournalism” who is Henri Cartier-Bresson. I then looked at what era he was in and it was the 1930s. I then looked in detail at the 1930’s to find out more about the age and about Henri Cartier-Bresson. I found that Surrealism was something that connected him to a lot of other artists, so I researched surrealism and artists to do with surrealism in the 1930’s. I then found Salvador Dali and began to research him. I have decided to look at the decade of the 1930’s for my Technology Context module. I think that this in particular is a very interesting era when a lot of ideas came about. This era was the build up to World War 2, it was the beginning of the great depression and surrealism was at its most popular with the Surrealist movement affecting artists. This era was the making for several great artists including Salvador Dali who I have chosen as my artist to research for the project, and Henri Cartier-Bresson as the photographer I want to research. I picked Heni Cartier-Bresson as he was not only a photographer but supposedly the father of modern photojournalism and seeing as I am doing a Photographic Journalism course I feel he is important. I picked Salvador Dali because of his artwork that many say was influenced by the Surrealist movement. I feel that his artwork was interesting and very topical at the time due to world events. I am discovering that the 1930’s was a dark era, with the Great Depression coming in 1929, then the 30’s was a time when America’s market crash caused economic downfall all over the world. The 30’s was the build up to World War 2 with the uprising of Adolf Hitler and Nazi Germany. I think that this dark time caused art to take a somewhat twisted view on things mainly persuaded by Surrealism. Both the artist and the photographer I picked from this decade were inspired by the Surrealist movement at some point and it affected their artwork, their opinions or frame of mind. Through research I have found that Surrealism inspired Henri Cartier-Bresson to become a photojournalist and take photographs of things he wanted to without having to label his work as Surrealism. Through a concept that the Surrealist movement shared on the Philosophy of life, Henri Cartier-Bresson developed Photojournalism which is why he can be considered the father of Photojournalism. This philosophy enabled him to take photographs with much deeper meaning, it also inspired him to become one the best photojournalists of all time as he was able to capture some of the most important moments in the 20th century. I found trying to find an Artist that could be considered similar to Henri Cartier-Bresson, but after researching Henri Cartier-Bresson and finding that Surrealism was an important part in the making of him and his career I began to look for artists in the 1930’s who were also to do with Surrealism. I researched and found Salvador Dali, I looked at some of his paintings and you can see from his artwork that he was affected by the surrealist idea. For example “The Persistence of Memory” painted by Salvador Dali was one of his most memorable surrealist pieces of work. I have found that my main resource for research has come from the internet. As there is so many online databases and search engines that can quickly find initial information needed for research. I also learnt in earlier lectures with Barbara price that with the use of the internet it is quick and easy to find books and journals from the Leeds Met library and also other resources online. I feel that all of these methods could become extremely useful throughout the course and also in a photojournalism career in the attempt to find sources needed for work. As for this module I feel that the internet is the quickest way to get the initial background I need and information for artists and photographers. I think as the module goes on books will become equally as important as sometimes the internet doesn’t have correct sources. I am going to compare two sources from the 1930’s that show two different sides of the era. The two sources show the difference in mood during the 1930’s. I researched the 1930’s and most things I researched showed that it was a depressing era with not much to look forward to. With the Great Depression beginning during the 1930’s then this seemed to be a major factor in peoples misery. The first source is a photograph from the 1930’s. This is a photograph that was taken in 1936. 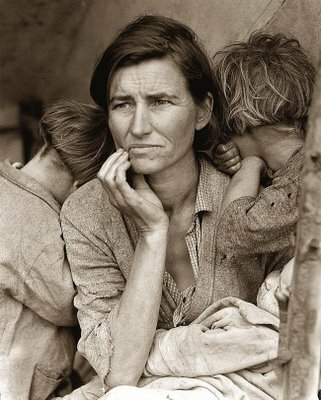 It was taken by Dorothea Lange. This photo was taken during the Great Depression. The impact of this photograph was to show the strength of people in America, but also to show their struggle during the depression. The mood of this photograph is powerful, it is upsetting because you can not see the children’s faces, perhaps showing that they are hiding from something. Whereas the mother looks on trying to think how she can provide for her children during these harsh times. I think that this photo is good for showing the 1930’s in the way that it was a struggle for a lot of people due to the Great Depression. I then turned to media to see if there was anything positive coming from the 1930’s. I managed to find Music that was being produced which perhaps shows the other side of the 1930’s. The second source I have chosen is a song called In The Mood by Glenn Miller. This is one of the most popular tracks during the 1930’s. I feel that this music source has a very upbeat for the 1930’s. Considering what was going on around the world, people were still capable of producing music that could make people happy and forget about their problems. It also shows that people were going through tough times but also perhaps still able to have a good time. I think that this song could have helped people get through the Great Depression as it is a very uplifting and happy piece of music. I think that music and film could have been a very important part of this era as perhaps people did not have much to celebrate or look forward to in their lives so it was up to music and film to take peoples minds off their troubles and just let them have fun. Rosenburg, J (). 1930s Timeline. Available: http://history1900s.about.com/od/timelines/tp/1930timeline.htm. Last accessed 22/02/2012. Wikipedia. (). 1930s. Available: http://en.wikipedia.org/wiki/1930s. Last accessed 22/02/2012. Nolan, S. Slaughter,B. (1999). Henri Cartier-Bresson: From a higher reality to a respect for reality. Available: http://www.wsws.org/articles/1999/nov1999/c-b-n05.shtml. Last accessed 22/02/2012. Lacayo, R. (2010). Henri Cartier-Bresson: Big Picture. Available: http://www.time.com/time/magazine/article/0,9171,1983899,00.html. Last accessed 22/02/2012. Springer, M. (2011). Henri Cartier-Bresson and the Decisive Moment.Available: http://www.openculture.com/2011/11/henri_cartier-bresson.html. Last accessed 22/02/2012. Surrealist.com. (). Surrealist Salvador Dali. Available: http://www.surrealist.com/artists/Salvador%20Dali/3b4c3c76-a8c0-4a34-a202-6200badf8cfd.html. Last accessed 22/02/2012. Wanczura, D. (2001). Salvador Dali Biography. Available: http://www.artelino.com/articles/salvador_dali.asp. Last accessed 22/02/2012. Descharnes, R. (). History of Art: Salvador Dali. Available: http://all-art.org/art_20th_century/dali-2.html. Last accessed 22/02/2012. Today Barbara Price showed us different websites that we will be able to use to research photographers for our next assignment. She showed us how to use the websites in order to find information needed for our research. Each different website has a different selection of material. lexisnexis.com/uk – Shows a bit of everything. jstor.org – Shows us journals from the past. pressdisplay.com – Shows newspapers, can search for photographers and articles about them. ted.photographer.org.uk – Shows famous photographers grouped by which decade they were in within the 19th & 20th century.